Saturday Night Fish Fry & White Heat present. 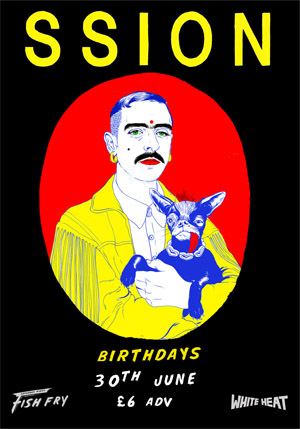 SSION (pronounced shun) is Cody Critcheloe. Critcheloe, the frontman-child, considers SSION to be more of a brand for his idea(L)s than anything else. SSION isn't from anywhere and it doesn't belong to any scene and it's not really that gay considering that in 10 years everyone will be gay. It's just a really interesting* mold slowly growing all over the world, sort of like the grateful dead but more body conscience.